no hay medio tiempo / there is no halftime features site-specific and cross-disciplinary works that incorporate wide-ranging references from sports field diagrams to Andean heraldic codes. 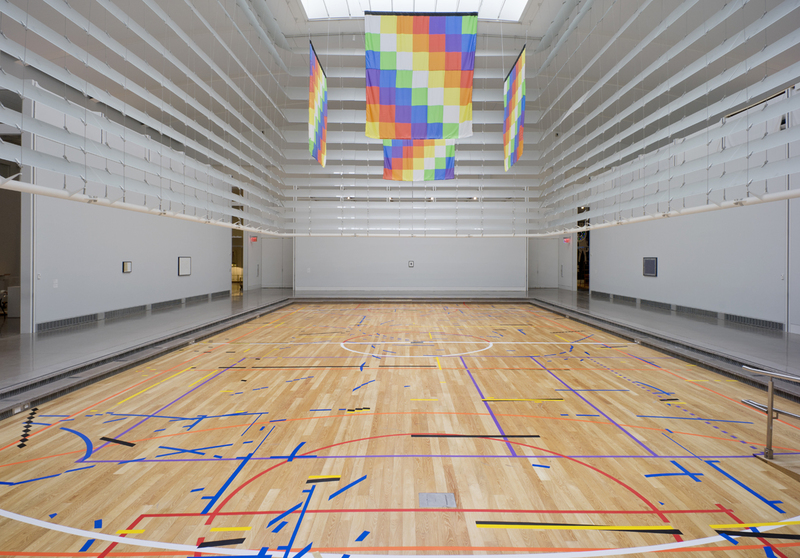 The exhibition’s centerpiece, no hay medio tiempo / there is no halftime (after Glissant and Quevedo), 2017, is a polychromatic line drawing executed directly on the 2,700 square foot expanse of the Museum’s atrium. The work’s dynamic composition echoes the Museum’s immediate environment of Flushing Meadows Corona Park, where various ball games are played daily by local immigrant communities, the work is composed of fragmented diagrams of basketball, soccer, volleyball, and handball courts. Having moved from Ecuador to New York City in the ‘80s, Quevedo’s work interlaces autobiographical and sociological insights in a reflection on his bicultural upbringing and his father’s soccer career as player and referee in both places. Taken together, the installation renders the disquiet, yet poetic and exuberant state of peoples and cultures in global flux through a materially syncretized and conceptually complex body of work. As one of three recipients of the 2016-2017 Queens Museum/Jerome Foundation Fellowship for Emerging Artists, Ronny Quevedo has spent the past year working closely with curators and other staff members to optimize opportunities to expand his practice. Quevedo, along with Sable Smith, and Julia Weist, whose works will be on view in Fall 2017, were selected by a panel that included Michael Conner (New Museum, New York), Lydia Yee (The Whitechapel Gallery, London), and Hitomi Iwasaki, Director of Exhibitions/Curator, Queens Museum. Ronny Quevedo (b.1981, Guayaquil, Ecuador) earned his MFA from Yale University and BFA from The Cooper Union. He has exhibited at numerous venues including The Drawing Center, New York City; Museum of Fine Arts, Houston; El Museo del Barrio, New York City; Upfor Gallery, Portland; Sicardi Gallery, Houston; and The Bronx Museum of the Arts. He has participated in residencies at the Lower Manhattan Cultural Council Workspace program, the Core Program at the Museum of Fine Arts Houston, Project Row Houses, Skowhegan School of Painting & Sculpture and Kala Art Institute. He has been published in Artforum for his collaborative project, Specter Field, with Harold Mendez. Quevedo currently lives and works in New York City. Ronny Quevedo: no hay medio tiempo / there is no halftime is made possible by the Jerome Foundation, celebrating its 50th anniversary. Exhibitions at the Queens Museum receive significant support from Ford Foundation and the Charina Endowment Fund. Major funding for the Queens Museum is generously provided by the New York City Department of Cultural Affairs, the New York State Council on the Arts with the support of Governor Andrew Cuomo and the New York State Legislature, Lambent Foundation, Booth Ferris Foundation, The Kupferberg Foundation, and the Laurie M. Tisch Illumination Fund.